Summer Adventure with R.O.X. Outdoor Festival 2016! | Let's Go Sago! Home / > Adventures • Go Events • News / Summer Adventure with R.O.X. Outdoor Festival 2016! Do you still remember last year’s R.O.X. Outdoor Festival? Well, they’re back again this summer with the R.O.X. 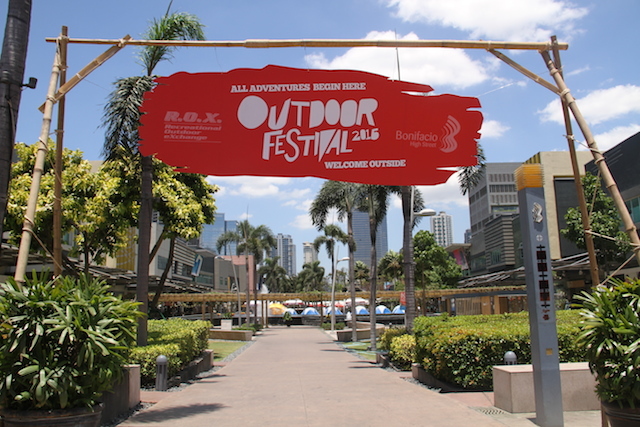 Outdoor Festival 2016 to share a greater appreciation for the outdoors, and foster a closer knit community amidst the busy, concrete world we live in. Today, April 16, until tomorrow (April 17), Bonifacio High Street becomes the home of athletes, weekend warriors, families and friends looking for a great time. There are thrilling games and challenging crash courses that is keeping everyone’s adrenalin high as it started this morning. Aside from the games and competitions, ROX Outdoor Festival guests are in for a treat as they will be shown cool outdoor film showings and band performances from bands like Up Dharma Down that will amp up the free-spirited vibe and friendly mood that will last throughout the festival. Acquaintances and even strangers will be able to converse easily and share their love for the outdoors in a natural setting of green landscapes and fresh air. For young families, children are also in on the fun as they can join exciting activities that will give them a taste of the great outdoors. Also check out the BRAVEN & Scoche Car Solutions booths! Pinapawisan ka din naman sa loob ng bahay, eh di lubusin mo na and join us today at @ROX_Philippines’ #ROXOutdoorFestival2016 in #BGC #BHS! Details for this #weekend #adventure at #LetsGoSago .net! Double tap if you’ll join us! R.O.X., Southeast Asia’s biggest outdoor superstore, is the go-to place for anyone who wants to gear up for the outdoors. Experienced and courteous sales staff can assist you in giving you useful tips and helping you find the best product to fit your needs. International brands, known for their expertise in creating superior outdoor gear and apparel, stock up the shelves and racks of the multi-storey building of R.O.X. in Bonifacio High Street, Bonifacio Global City. The North Face, Salomon, Fox, Columbia Sportswear, Mountain Hardwear, Sea To Summit, Poler, Eddie Bauer, Quiksilver, Roxy, O’Neill, Volcom and DC are just some of the premier outdoor brands that are available in R.O.X. Whether it’s climbing, trail running, biking, camping, swimming or surfing, you can find all your outdoor needs met in R.O.X..
ROX Outdoor Festival 2015 – Last Man Standing! Get out and experience life the way it should be lived. Be part of the great outdoors and visit the R.O.X. Outdoor Festival 2016 today and tomorrow!